There are so many vets who never take a cat’s blood pressure despite the fact that it is crucial. One of the leading causes of blindness in cats is hypertension (high blood pressure). There are also many many causes of cats having strokes and their cat parents finding them dead. This can easily be avoided by simply getting your cat’s blood pressure taken. This is especially important in older cats or cats with chronic renal failure (CRF). Â The vet or tech puts a small cuff on your cats leg and it takes less than 5 mins to check it. They typically take it a few times and use an average. They also take into account that blood pressure in cats can go up by 20pts due to stress. If they blood pressure is elevated the vet will put your cat on blood pressure medication and recheck in 7-10 days to assure it has not gone too low. Once the BP is stabilized your vet will check it every few weeks or months depending on your cat’s health. There is a symptom of high blood pressure that many people do not even know about…night howling. Cats with high blood pressure many times will howl at night. Recently one of our cats started doing this and sure enough his blood pressure was off the charts! If I had not known about checking blood pressure or night howling, there is a good chance that our kitty could have had a stroke or have gone blind. If you vet does not take blood pressure…find another vet! 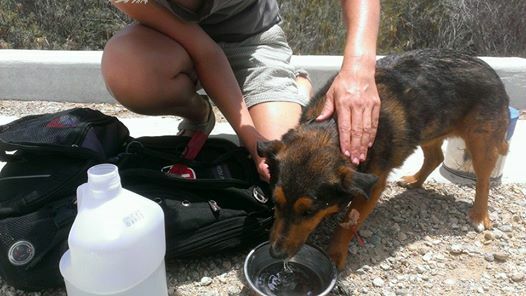 A few weeks ago while hiking in Palm Springs I heard about a dog Ellwood who was missing. Ellwood had been hiking with his mom (off leash) and was at the top of a mountain when 3 other off leash dogs attacked him. In a desperate attempt to save Ellwood his Mom told him to “RUN!”. Well run is what Ellwood did…but sadly he ran too far and was lost. People looked everywhere on the mountain for hours but could not find Ellwood. As it started getting dark everyone was even more concerned. Ellwood was a little dog about 15 pounds and certainly would be in danger of being eaten by coyotes plus it was 100 degrees and the mountain has lots of rattle snakes. Ellwood’s Mom took pieces of her clothing and scattered them down the mountain in an attempt to get him to get off the mountain. She also put water bowls and his beds on the bottom. By the next day most people were losing hope. It was very hot and a small dog alone in a canyon had very little hope of surviving. Ellwood’s mom did not give up…she continued to post signs, post on facebook groups, and was out looking day and night. After TWO nights there was a reported sighting at a golf course (that was located down the 8,000 foot elevation mountain where he was lost). Yes, it was possible it was him but could he have survived and gotten down the mountain, across the busy road and into the golf course? When I heard there was a sighting I ran out again to help look. I had been losing sleep worrying about this little guy and could not stop thinking about the danger he as in. When I got to the golf course I walked and looked in every bush and ditch I could find. I started asking each employee if they had seen him. Several said they had seen him about 6 hours earlier running around scared. I finally met someone who gave me more details and showed me the last place he had seen him. I had a VERY strong feeling that he was hiding in the bushes close to where he was last seen. It was very hot and there were people on the golf course so I thought he would probably just hunker down until it was cooler. I called his mom and asked her to meet me. I told her I had a feeling he was in these bushes and if he was I did not want him to get scared and run. Thankfully she did not think I was crazy and she did meet me. We started waking along all the bushes. The first one we heard a lizard and got excited but quickly realized it was not Ellwood. The second bush she called “Ellwood” and we heard a little jingle…she called him again and sure enough sweet Ellwood came out SOOOO happy to see him Mom. His Mom and I both cried as Ellwood was just so relieved to finally be safe. He had a bad bite mark on his which was probably from the dogs who attacked him and he was limping bit other than that he was great. He could not get in her car fast enough!!! A few lessons learned from Ellwood: 1. NEVER hike with dogs off leash. There are too many things that can go wrong including snakes, coyotes, other dogs, etc. Dogs just want to be with their people…they do not need to be off leash. 2. Never give up if you lose your dog. Ellwood’s mom was determined. She never stopped looking and hanging signs. She also had lots of other people helping. 3. Follow your instincts. This has helped me so many times and this time it helped Ellwood. I knew when I left my house that I was going to find him and I KNEW after walking the golf course for several house and talking to people that he should be in those bushes. Sure enough…my gut instainct was right and I found Ellwood! Not sure why I took a break from my blog but I guess that life just happened and my blog was the one who suffered. =) I plan to blog a few times a week focusing on animal issues and issues that are close to my heart. I am always open to suggestions if you want me to address something that you are interested in…so…stay tuned! Info on hermobartonellosis and the importance of following your instincts…a must read if you have cats! AboutÂ seven weeks ago I noticed that our cat Longtail seemed to be drinking a bit more water than normal. It was very minimal and it was hot out but something told me it was time to get this 12 year old boy a senior blood panel to make sureÂ his kidneys were functioning properly.Â Longtail is extremely shy so I decided to take him to the closest vet possible to limit his time in the car.Â When we got the results of the blood work I almost had a heart attack. Although his kidney values were normal his white blood cell count was dangerously low (1.8 when normal is 3.5-16). and his red blood count was low too (HGB was 8.3 on scale of 9.3-15.9 and HCT was 25 on scale of normal being 29-48). I panicked and immediately called the vet. Longtail was not showing any symptoms so the vet brushed off my concern and blamed his white cell count on the fact thatÂ Longtail had Pan Leukopenia 2 years ago. This did not make sense to me since his blood work after the pan leuk had confirmed that his white blood cell count had returned to normal. I faxed his blood work to another vet for a second opinion. The other vet toldÂ me to rule out FVI,Â FeLV (feline leukemia) and to posiblyÂ do a bone marrow aspirate. IÂ brought Longtail back in and had him checked for FIV and FeLV and both were negative. I decidedÂ I did not want to put him through a bone marrow aspirate. An amazing holistic practitioner I work with told me to take him in andÂ do a reticulocyte count to make sure his body is actually making red blood cells.Â This came back normal as well. No one could tell me what was going on but I KNEW in my heart that a low white blood cell count can be deadly for a cat (this is how they fight off infection and sickness). I started Longtail on Chinese herbs that were recommended by the holistic practitioner to try and boost his blood cell count. This last Thursday (seven weeks after the first blood panel was done) I took him in for a follow up to see how his blood looked. The results came back even more devastating…his white blood count was now down to 1.5. Again, not even a call from the vet who took the blood…no concern at all that something major was wrong. However, I emailed these results to 2 people…one was the holistic pracrtioner (who by the way is not a vet) and a friend who is a research scientist and one of the smartest people on this planet (also not a vet). Both contacted me right away and said “get him checked for hemobartonellosis (also known as hemobartonella, hemofelis mycoplasma and ricketsial infection). Hemobart is a blood parasite usually contracted through fleas or ticks. The tricky part was finding a vet who actually knew how to do this test and what to look for. Clearly two vets had already failed Longtail in not even thinking about this as a diagnosis.Â Many veterinarians routinely test for the disease by sending blood samples to an outside laboratory.Â The laboratory will almost always return the following statement:Â “No organisms found.”Â What that means is that they’ve examined the blood sample under a microscope at a magnification of 1000 and saw no parasites attached or near the red blood cells.Â The reason that they don’t see any organisms is that the preservative used to protect the blood sample from coagulating during shipment washes away all of the organisms!Â The only correct procedure for testing for the organism, optically, is to take blood directly from the animal and prepare a slide immediately and examine itÂ at the hospital using a diffraction limited (i.e. really good) microscope.Â A few texts on hematology make a point of emphasizing the correct procedure, but unfortunately most veterinarians aren’t informed.Â Sometimes, the doctor will request a reverse-polymerase-chain reaction (PCR) test to determine if the organism is present in the animal’sÂ (catsÂ or dogs) blood.Â The problem with PCR testing is that it is so sensitive that it will return a positive result even if the animal has a non-clinically significant infection.Â A negative result can be used as a “rule-out”, however.Â Optical examination and verification is the gold standard for diagnosis of this kind of disease. We rushed off to Jansen Animal Hospital in Torrance…this is an INCREDIBLE hospital that our scientist friend told us about. They have an internal lab and they know how to diagnose hermobart. Sure enough…five mins after taking blood they confirmed that Longtail had hemobart. Finally a diagnosis! Something that can be cured if caught early enough! What a relief. * This parasite attacks the red blood cells and basically kills them. The white cell count can go down because the white cells start fighting off the red cells. So essentially it is like the cats body is fighting against itself. * If left untreated this could kill your cat. However, if you catch it it is 100% curable. Many times cats will show symptoms such asÂ lethargy (so hard to diagnose since cats sleep 18 hours a day anyway! ), lack of appetite, pale gums due to the anemia (low red cell count) and can even have labored breathing and heart failure. However, there are many, many cats like Longtail who do not show any symptoms until it is very advanced. * Longtail received a shot of steroids which helps the white blood cells and is taking Orbax for a week.Â At the end of the meds we will have his blood retested to make sure all organisms are gone. In addition, all our other cats are being treated as well. * Even though our cats are strictly indoor cats they ended up with fleas this past summer and that is most how he got hemobart. Because it is passed from animal to animal through flea bites, all our cats are being treated. however, it is highly unusaly for dogs to get it so our dog is not being treated. * If your cats end up with fleas you may want to checkÂ their red and white blood cellÂ count. I met Red a year and a half ago when I rescued my first pigeon. She was the bird I rescued from the on-ramp of the 110 freeway. She was only a baby who had been attacked by a hawk. A friend gave me Red’s number and said he could show me how to care for the bird but she warned me not to give him the bird under any circumstance.Â So, I did just that…I had him come to my house, show me how to tube feed and how to care forÂ the baby pigeon. Each time Red came over he wanted to stay longer and longer…it was obvious he was a lonely person with no family and very few friends. One night Mark and I invited him for dinner. We sat on our deck and he told us over and over how happy he was we invited him and it had been years and years since he had had a meal with someone.Â I guess you could say that we became his friends with the love of animals as our connection. During our time together, Red would tell me about how animal control went to his house in 2005 and killed all his birds. Each time he mentioned this situation he broke down in sobs and tears…it was heartbreaking. He truly loved those birds. He told me that he never returned to his house and it still sits empty. He was renting a 10Â by 10 room from someone since it was too painful to return to the house where he lived with his bird family…very sad. However, the more we spoke I realized that he had no problem keeping pigeons in cat carriers forever. He felt they were happy and safe from hawks. Of course I did not agree…all animals need a quality of life and if birds have wings they should be able to fly. When I made the decision to allow my little pigeon the chance of freedom, Red was furious with me. For many weeks he would call and yell at me. But, I knew I had made the best choice for that bird so I just let him rant and rave at me. It was about 2 months later thatÂ he showed up knocking on my door that he needed help rescuing 100 birds from a hoarder.Â I helped arrange a place for the birds to go and once again Red and I were in contact. Out of that 100 birds who were rescued, 5 beautiful King pigeons were put in my garage. When Red asked to put them in my garage IÂ made it very clear to himÂ that they will not live in cages forever. I once again told himÂ that I felt that birds should not live in cages. So, I took in those 5 King pigeons and learned more about pigeons than I ever thought there was to know! I watched the males bring gifts of straw to their mates, was greeted by a “hoo” when they saw me and was “wing slapped” by one I named Lady Bug when I tried to take her egg. They were amazing birds with so much personality. I made the decision to let these birds live in the HUGE aviary in Malibu. The aviary is about 3 stories high and about 60 ‘ by 50’. King pigeons really do not fly so all that ground space was ideal for them. My friend Beth and I put together nesting boxes for them, created sand boxes, little baths, etc. It became a paradise for these 5 birds. When I told Red that I was moving the birds to Malibu he lost it on me…yelling, screaming, calling me over and over and even threatening to sue me.Â He kept saying “if caring for these birds is too much than I will take them”. I told him over and over that it was not about me it was about these birds having a quality of life.Â I received letter after letter about court dates and that he was suing me for these birds but I just ignored the calls and letters. Several people said “why don’t you just give the birds to him so you do not have to deal with this?”. But, I held my ground for the happiness of the birds and moved them to Malibu.Â I felt their happiness was worth anything that may happen in court…I would deal with being sued for these 5 sweet birds. What a great decision…the birds were THRILLED the moment we let them out of the cage in Malibu. They were exploring, flapping their wings, taking baths…pure happiness! To this day the birds are so happy…and still greet me with a “hoo” when they see me. That situation was the start of a new life for those birds and an end of an awkward friendship with Red. Â This past Monday morning I saw I missed a call from Red. I found that odd. IÂ later learnedÂ that the missed call was from the hospital looking for any family members of Red’s (they went through is cell phone) because he had died. I panicked about the birds that I knew he had at the room he rented in a house. He often spoke of different birds he had who he claimed could not be released for one reason or another. So I spent all morning trying to track down Red’s birds. Animal Control said they were called out to his house Monday morning but when they saw the place they called the Dept of Health. Dept of Health told me they went out and planned to come back in the eve (toÂ “get” aka kill the birds)Â but when they arrived the birds were gone. They said Red’s landlord told them a landscaper came and took the birds. I was horrified thinking that maybe some person wanted to eat them (they eat pigeons in Mexico and other countries). Without knowing where Red lived, I went to the street that was mentioned in the newspaper article. It was very easy to figure out which house was his. It is your typical hoarders house. The door was wide open and there was trash everywhere. After calling for about 5 mins for someone I decided to leave. That is when I saw some guy in the house. I called to him and he came reluctantly came out. He was filthy dirty, had a hard time communicating, a bit confused…really, really sad. I explained to him that I wanted to save the birds and I needed to know where they were taken. He went in the house and came out with a business card and said “he came to get the birds”. Sure enough…it was a card for a landscaper. He said the room Red rented in that house was beyond anything you can imagine. About 110 birds in carriers (and a few loose) and about 4-5 inches of hard poop and feathers everywhere. Each carrier hadÂ 5 inches of hard poop inside. He said after seeing the room he realized that Red had more mental problems than anyone really knew. I went to the landscapers BEAUTIFUL house and saw the birds… I wanted to see them with my own eyes. The first thing I saw were the empty carriers they had lived in for years…they wereÂ all piled up on the lawn waiting to be cleaned or thrown away. I could not believe what I was seeing…the carriers were so filthy that the birds actually only had about 1/2 of the space to stand. It broke my heart to think they had been living in those conditions for so long. Then…I saw where the birds are now…paradise! They were so happy to be able toÂ socialize with other birds, take bathsÂ and leave the coop if they want to fly. It was beautiful…pure joy. I am actually sad for one bird …he is a PMV (horrible pigeon disease) survivor who Red took with him everywhere. That bird really loved Red…I witnessed that bond myself.Â Red would sit at Starbucks each evening with that bird on his lap. Everyone who knew Red also knew that bird.Â I think he was the only luckyÂ bird of Red’s birds and he is probably now mourning the loss of his companion. It is sad to say that Red’s passing was probably the best thing that happened to his birds.Â I look back and wish I could have helped thisÂ troubled man.Â He was very intelligent…an engineer and an attorney…but could not see rightÂ from wrong regarding the housing of birds. In his mind and heart he was protecting them by keeping them in small cages…Â sad, sad, sad. No one can deny that Red loved birds in fact someone said to me yesterday “Red would have jumped in front of a train to save a pigeon”. So true. I learned a lot about pigeons from Red and for that I am thankful. I also saw a bond between a human and a pigeon that I had never seen before. I will use thatÂ memory as motivation to find that one bird a home where he can once again bondÂ with a human.Â Â Rest in peace Red…the birds you loved to a fault are now safe and happy…truly what you wanted deep down but mentally could not achieve. It isÂ no surpriseÂ that the pork industry is upset that there has been a decline in the sale of pork since the swine flu epidemic. They have gone so far as to ask the World Health Org to change the name of the flu. How about they stop putting energy into the name of the flu and look at what is causing it? When you cram pigs, cats, chickens, dogs, or even horses into a space that is so small they can’t even move and deny them every bit of comfort… of course the animal is going to get sick. This is no surprise. We see it at animal shelters on a daily basis. The cats and dogs are kept in small cages, are under incredible stress and come down with URI (Upper respiratory disease). It is the same thing with pigs. These factory farms cram about 5,000 pigs into one shed, place each individual pig in a metal crate (on cement) that is so small the pig can’t even lay down or turn around and force them to “live” like that for their entire life…sometimes a few YEARS! Is it really a surprise that the pigs get sick? Of course not. Think about when you are under a lot of stress from work or school…that is when you get a cold or the flu. We need to go to the source of this problem and stop treating animals like they are not a living, feeling being. As consumers you can make a difference…do not buy pork. Do not support companies that are treating animals in a way you would never do yourself. Do not support companies that are putting the entire world at risk with epidemics like Swine flu. Pigs are smarter than dogs…this is a known fact. Do you have a dog? Would you ever make your dog live in a cage so small she could not even lay down? Would you pump your dog with antibiotics when she gets sick in that cage instead of giving her more space? Would you deny your dog access to sunlight and fresh air? Of course not…then why support companies who do this to pigs? Start today by saying goodbye to pork products…healthier for you, healthier for the pigs and healthier for our planet! These instructions are not for moving feral cat colonies. Let me state right up front that I am not in favor of moving feral cats who are already in a colony. There are always ways to work through any conflicts that are occurring in an area where a colony already exists. The group Alley Cat Allies has great info to help you resolve any conflicts. In addition, humans should never judge how good an area is for feral cats. I have been contacted many times from people who want to move a feral cat colony because the area is “horrible for the cats” . Typically, the area is horrible for humans not the cats. Cats want to remain where they live and where their friends and family live. They are extremely habitual animals who do not like change. They do not care if a neighborhood is dirty, busy, low income, etc. People always use the argument that “maybe the cats won’t be safe where they are”. However, that argument is the same useless argument that zoos use for capturing wild animals and putting them into captivity and sadly was one of the arguments slave owners used for keeping slaves captive. Therefore, I ask you to use these instructions to help feral cats who end up in shelters and have no other choice but to be recolonized. Focus on the cats who need your help the most…not the ones who are already safe. * How feral cats end up in shelters and how you can prevent that from happening. * Rescuing the cats and what to have done before they leave the shelter. * Setting up the cages. * How to organize this program in your group or with some other volunteers. Typically feral cats who end up in shelters have absolutely no way of getting out alive. Who is going to adopt a cat they can’t pet or love? Rescue groups typically do not want to rescue a feral cats because they do not want to get “stuck” with the cat. If you follow this program you will be able to rescue an enormous number of feral cats from the shelters. In fact, just in the past 2 weeks, I have rescued over 25 feral cats from 2 shelters in the Los Angeles area. In total I have rescued almost 100 feral cats in the past year and I am doing this program on a very part time basis. You may be wondering how I am able to find homes for cats who are wild and want little to no human contact. The key to this program is that you are not looking for homes…you are looking for yards or outdoor spaces. Once you find appropriate yards (how to find an appropriate yard/space will follow) you will rescue the feral cats from the shelters, put them in large cages for 30 days to recolonize them(so they know that is where they live and will be fed) and then release them to live in the yard where the cages were placed. Once released the caregiver will continue to feed the cats. It is truly that simple. However, there are many details you must follow in order to keep the cats safe, keep the caregivers safe and assure the cats will stick around once released. Feral cats are usually brought into the shelter by people who do not want the cats in their yards. People will borrow or buy a trap, trap the cats and then drop them off at the shelter. Most of these people do not realize that by dropping the feral cats at the shelter they will be killed. The key to stopping this is education. Start with educating the shelter staff about TNR (trap, neuter, return). Ask the shelter staff to suggest TNR to people prior to lending a trap to the public. You can find very helpful information about TNR on Alley Cat Allies web site (Alleycat.org). There are lots of animal lovers who would love to help save cats by allowing them to live in their yards. There are also companies who would love to have cats in their offices or factories for rodent control. In fact, I have even placed feral cats at several of the police stations in Los Angeles for rodent control. You need to get the word out that you are looking for yards. Start with an email alert to everyone you know. You can also place ads on craigslist, through civic organizations, school groups, PTA’s , hang flyers at vet offices, pet stores, the gym, etc. People with yards needed to help save cats! We are DESPERATE right now as the shelter has given us till _____ to get 4 feral cats out or they will be killed. They are all feral so we are looking for yards to recolonize them. This would involve them being in cages for 4 weeks (that we supply) so they know they live in your yard and get used to noises, dogs, kids, etc. After 4 weeks they are released and you will continue to feed and water them. We will pay to have them spayed or neutered, vaccinated, microchipped, and have their ear tipped (universal sign that they are fixed).Â Then, we will set up a cage that the cats will live in for 3-4 weeks so that they realize that your yard is their new home.Â After they are released, you will just have to give them food and water.Â You do not need to take all of them…even if you can take 1 or 2 it would help. Please contact ______ at ________. 1. What city are you in? 2. Do you see coyotes in your area? how often? 3. Are there other outdoor cats in your neighborhood? 4. Will you be willing to feed and water these cats? 5. Do you own or rent? If an area has lots of coyotes and no outdoor cats it would just be a death sentence for the cats so pass up that yard. I never place feral cats in yards in the hills in Los Angles such as Malibu, Beverly Hills, etc. because there are way too many coyotes. If the person does not own their house ask how long they have been there and how long they plan to live there. They will need to understand that if they move they will need to find someone else to feed the cats or trap and take them with them (and follow these instructions all over again when they move). Â * Get the cats out of the shelters who are classified as feral and have no chance of getting out alive. * Ask the shelter questions to find out if any of the cats came in together. It is always better to keep bonded cats together. * Ask if the cat was an owner turn in or came in in a trap. Sometimes cats who were turned in by owners appear feral when at the shelter. * Have the shelter spay/neuter the cat prior to taking the cat. Be sure to CALL the clinic the morning the cat is scheduled to be fixed and tell them to do the following: 1. Only use dissoluble stitches. You do not want to have to bring a feral cat back in to have stitches removed. 2. Leave NOTHING around the cats neck…no tag, band, etc. 3. Ear tip the cat. This is a universalise symbol that the cat has been fixed. The vet will take off the point on one ear while the cat is under anesthesia. 4. Have the cats microchipped so if he/she ends up back in the shelter you can save the cat. 5. I do not test the cats so don’t worry about combo testing. 6. Give the clinic a small cat carrier with a towel in it to put the cat in after the cat has been fixed. This will save the cat the stress of trying to transfer the cat into the carrier once she/he is awake. Use the smallest cat carrier you have so it will make it easy to transfer the cat into the cage (more on this later). Be sure to cover the cat carrier with a towel when you pick the cat up…this reduces stress. 1. Extra large wire dog cage. 5. Small litter box or wash basin that can be used as litter box. 6. Cardboard nesting box (apple boxes and cardboard file boxes work great). 9. Cheap dry cat food and wet food. Ideally, the best place to set up the cages is in the person’s garage. This will offer the most protection from the elements. However, not everyone will want the cats going in and out of the garage once the cats are released. If the person does not want the cats in their garage, pick a place to put the cages that will offer the most protection from rain, sun, etc. Under a covered patio is a very good spot. If there are no covered areas be sure to use tarps to protect the cats. * Do not put all of the supplies in the cage before the cat is in the cage. You will need the space to get the cat transferred. Start out with setting up the cage (zip tie any area of the cage that does not seem safe and secure), place a towel down on the bottom of the cage. Cover the back half of the cage with a blanket or sheet (depending on the weather). Place the apple box in the cage and face the opening away from the front of the cage. If you are nervous about transferring a feral cat into the cage don’t put a box in the cage and you will be use the cat carrier as a hiding place for the cat. Put cat nip and a toy in the cage. Do not put food, water and litter box in yet. * The best thing to do is to put the entire small cat carrier in the cage with the door opening toward the back, lean in and open the cat carrier door and use a zip tie or baggie tie to secure the door to the cage so it does not close on the cat. However, you may not have enough cat carriers to leave the carrier in the cage for a month. If this is the case you will need to transfer the cat from the carrier to the cage. NEVER grab the cat or try to touch a feral cat. Cat bites are VERY serious. In addition, you will risk losing the cat. * Be sure the back half of the cage is covered so the cat feels that that half of the cage is his/her safe place. Do not have anyone standing on that half of the cage. If someone is helping or watching they need to be behind you. Put the entire cat carrier in the cage and close the cage door. BE PATIENT. Many times the cats will just come out of the carrier and go to the apple box that offers them more space and cat nip. You can even walk away (as long as the cage is securely locked) and give the cat time to come out of the carrier. If the cat won’t come out of the carrier, you will need to encourage the cat by lifting the back of carrier up and trying to get him/her to come out the front. This is tricky as you must be careful the cage door is still able to close should the cat run toward you. NOTE: I HAVE A FREE DVD TO SHOW YOU HOW TO DO THIS. Once the cat comes out and is in the apple box, quickly take the carrier out. Do not try and take the carrier out until the cat is sitting calmly in the apple box. * Once the cat is in the apple box and the cat carrier is out, you can put the food, water, liter box and small paper plate of wet food inside the cage by the door. Do not put any of these items too far in the cage. You must make it easy for the caregiver to get to them without letting the cat out. Always have your hand on the cage door and be ready to close it quickly should the cat run. Never open the cage if the cat is not in the back of the cage in the box. 1. Name and talk to the cats each day for at least 30 mins. 2. Never open the cage if the cat is not in the back of the cage in his/her hiding box. 3. Each day open the cage door carefully and remove the dry food bowl, water bowl and litter box. CloseÂ and lock door. 4. Change litter (put only about 1″ in box since you will change it each day), fill water and dry food bowl and put wet food on a small paper plate. 5. Open cage and put all of the above in there at once. This limits the amount of time the cage is open. When you feed the cat it is a good idea to say whatever you will say to get the cats to come to you once you release them (i.e here kitty kitty, want to eat, etc). 6. If the cat is on medication, put the meds in a pill pocket (can be purchased at most pet stores) and put the pill pocket in the middle of a small amount of wet food or chicken baby food. 7. Be sure the cat is eating, peeing and pooping. 8. If it gets cold or rainy be sure to cover cages with tarps and/or blankets. 9. You can give treats through the bars each day. 10. Never try to pet or grab a feral cat. If the bedding gets wet and you need to change it call an experienced feral cat person and let them take care of it. 11. Be sure that before you release the cat that there are good hiding places for the cat to go under/in. Alleycat.com has lots of inexpensive shelters you can build or buy. 12. The three most important things to make re-locations successful are: Â yummy wet food each day (they typically like the junk food like friskies), talking to the cats and keeping them in cages for 30 days. 2. Place plywood leaning up against a fence or wall so the cats can hide behind it. 3. Put a large piece (like 8′ by 8′) of plywood on top of cinder blacks to create a “wood bed” they can hide under. 4. There are also shelters you can purchase online. Once hiding places are set up and the cats have been in the cages for 4 weeks, it is time to release them. 1. Just open the doors of the cages and walk away. I prefer to do this during the day so the cats won’t wander too far the first day. They will typically come out of the cages and find a hiding place in the yard and stay there until it gets dark. At least they will know where a good hiding place is before they start exploring in the dark. 2. Leave really stinky food out for the cats outside of the cages. Put a bowl of dry food, plates of wet food, water and a dish of mackerel or sardines. 3. The caregiver should still call to the cats when feeding them even if they do not see the cats. It is not unusual for the cats to disappear for a few days once released. Keep putting food out regardless of if you see the cats or not. 4. Leave the cages set up for about a week (more if the cats are going back in the cages to sleep). 5. When done with the cages, carriers and litter boxes clean with an 8 to 1 bleach/water combo. This is VERY important to prevent the spread of disease. 1. What do I do if the cat is not eating? It is not uncommon for a feral cat not to eat for a few days when in a cage. However, the cat can’t go more than 3-4 days without eating or drinking. If the cat is not eating first try offering her/him different types of food. Give dry cat food (cheap cat food is more appealing to most cats), wet food, turkey or chicken baby food, etc. Also try covering the cage completely with a sheet to make the cat feel safe. If the cat still does not eat after several days you may have to take the cat in to the vet to get fluids. Unfortunately with feral cats this will involve putting the cat under anesthesia so be sure to try everything possible before taking to the vet. 2. What do I do if the cat turns out to be friendly? You can either put up for adoption, leave the cat outside in the yard to be a outdoor cat or see if the person who is caring for the cat would like the cat to be able to come inside. 3. What do I do if the shelter left a tag around the cats neck? You will have to have a vet put the cat under to get the tag off. NEVER use a catch pole on cats. NEVER try to grab the cat to get the tag off yourself. 4. What do I do if the cat is sick? Put the cats medication in a “pill pocket” (available at most pet stores) and then place the pill pocket in chicken baby food, sardines or mackerel. Do not try to put the pill in the cats mouth. 5. What do i do if the cat escapes before the 4 weeks is completed? Leave food and water out at several different places around the house. Leave bowls of dry food and plenty of water. Set traps at night using mackerel or sardines. Always check the traps every few hours. Turn loose any other animal you trap right away (including raccoons, skunks, etc). If you trap the escaped cat put back in the cage following the aforementioned instructions. Hang signs in the neighborhood asking people to contact you if they see the cat. Continue to leave food and water out…do not assume the cat is gone. After a week of trying to trap the cat, you can stop trying to trap but MUST continue to feed. Leave dry and wet food and water out for the cat. If all the food disappears each day you may also be feeding wildlife. If only the wet food is gone you are only feeding cats. You can also put baking flour around the food bowls to determine what type of animals are eating (you will see the footprints). Once the cats are released it is best to leave them where they are. The caregivers should find someone else to feed the cats. If the new feeder can’t feed at the exact location, they can slowly move the feeding station. This should be done over about 30 days. Every few days move all the food and water bowls closer to where the new feeding location is located. 7. How do I know the cats I am recolonizing won’t fight with each other or other cats in the neighborhood? First of all the cats are fixed which reduces fighting tremendously. In addition, the cats will be meeting each other through a cage for 30 days so will get to know each other. 8. Should I put 2 bonded cats in the same cage? If you know for CERTAIN the cats are bonded and the cage is big enough it would be great for them to be together. The only challenge this creates is if one of the cats is sick or is not eating. If you do not put them together in a cage be sure to at last put the cages right up next to each other so they can touch noses and paws through the cages. 9. What do I do if the cat is too sick to be fixed when leaving the shelter? Once the cat is well enough you will have to bring back to the clinic to get the cat fixed. 10. What do I do if a cat bites me? Go to the doctor immediately and get on antibiotics. Do not kill the cat for fear of rabies…there has not been a confirmed case of rabies in cats in years and years. Carrier: used to transport cats. Always carry from bottom and double check the safety of the carrier. TNR: Tran-Neuter-Return. A way to prevent feral cat colonies from increasing in size. The cats are trapped, fixed and released back to their colony. Trap:a humane device used to trap a feral cat. Ear Tip:a universal sign that a cat has been fixed. Lysine:a great nutrient to give cats to prevent them from getting sick or help clear up Upper respiratory infections (a kitty cold). Open a 250mg capsule per day and sprinkle in cats food. Microchip: the size of a grain of rice. It is injected into the cat and remains there for their entire life. If the cat ends up in the shelter, Â the shelter will scan the cat for a chip. The chip contains an id number that is associated with your contact info. All cats should be microchipped. Transporter: This person will transport cats and cages. Supplies coordinator: Keeps a supply of litter boxes, towels, etc. and brings supplies to locations when needed. Administrative assistant: Registers all micro chips, keeps a chart of cats microchips and where cats are located, keeps track of where cages are located, keeps chart of potential yards to use for cats, release dates, etc. Shelter Contact: Keeps track of any feral cats in shelter and secures the cats release. Communicates with the shelter or spay/neuter clinic to make sure the cats are fixed, eat tip, dissoluble stitches, etc.